This type of planned coincidence has happened a handful of times during the last two years with no sign of slowing down. On at least one of those occasions, a racer by the name of Rat Boss wore nothing but a cape, a thong, a pair of spray-painted work boots, and a 49ers football helmet. 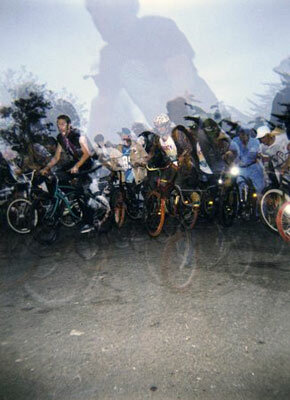 Another, six-foot-eight and named Tree, wore a princess-pink skirt, a pink helmet with blonde pigtails attached, and a jean jacket with “K$N” painted on the back. Tree’s cruiser is spray-painted baby pink and has disfigured Barbie dolls attached to every part of the frame. PaPa Patossi sported a platinum blonde wig; Nima dressed himself in a pink tutu. Todd Darsh disguised himself with glasses and a makeshift fat suit consisting of a pillow stuffed under his shirt. 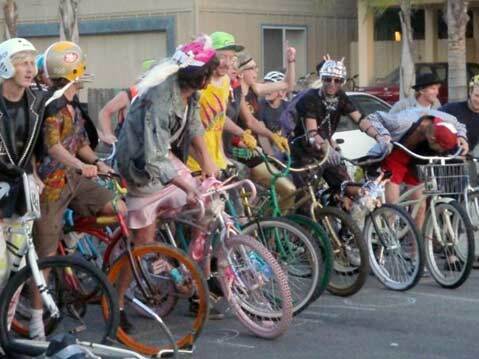 Many racers wear embellished helmets-decorated with their underwear, in some cases-and most had spraypainted or otherwise beautified beach cruisers. 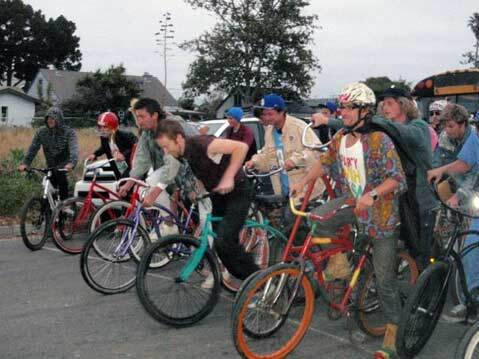 While the rest of Isla Vista was playing beer pong or flip cup, the gentlemen and a few ladies of Kroozr $kid Nation were racing lap after lap, pounding beers at the completion of every round. Many crashed, and many vomited during the heinous course. All threw fat skids and yelled with utter abandon. “Some of my best memories were from races like that,” said Austifari, one of the original nine cronies who started K$N. “Puking all over everything with half a beer to go before the next lap. Just losing it with a sledgehammer and going after a burning bike,” he added, referring to the bike sacrifice that serves as the grand finale. After the race proper, the racers smell quite awful and have intense difficulty walking, but no problem cruising. They throw empty beer cans and yell at anything that moves. Then comes the victory lap. 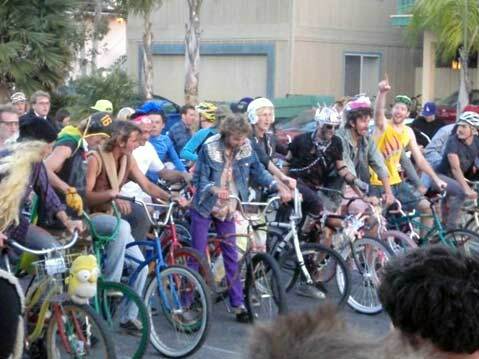 Everyone that shows up with a bike gets in on it. “Sometimes the pack was half a block long,” Austafari reminisced. “We’d circle intersections and block traffic and just scream out brains out. A lot of the time we’d chant ‘Kroozr Skid Nation’ or ‘Here we go, pitbulls,’ things like that. You’ve never shouted so loud, so earnestly,” Austafari said. They cruised from Isla Vista to campus, the ruckus reaching its peak around Pardall Road, in the center of Isla Vista, where passersby and the people in the bars come out and stare wide-eyed at K$N. After the victory lap, the Nation traditionally sacrifices a bike that has nothing left to give. “You know, bent frame, broken forks, KMart mountain bikes that we pulled out of the ocean or the gutter. Really anything that couldn’t be salvaged and that would be satisfying to destroy. As long as it was a bike, you know,” Austafari said. They set the chosen bike on fire. And so, what started as nine guys riding their beach cruisers (and never fixed gears) has everywhere come to be known as Kroozr $kid Nation, hosting an array of unofficial cruiser races with names like “Tour de Fuq” that are more drinking competitions on bicycles than serious races, though to be sure, the gang still hands over a trophy to the victor.